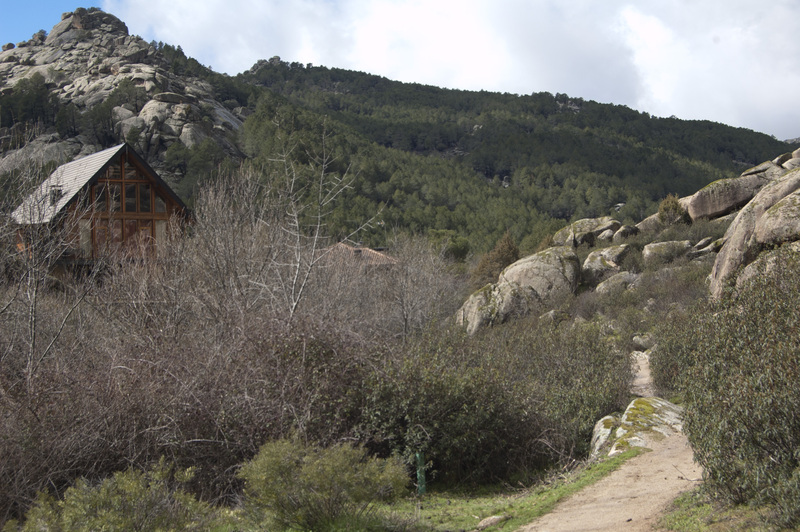 Around this time of year in the Sierra de Guadarrama, a snow-capped mountain range outside Madrid, the snow is starting to melt. Below the tree line, the melting water soaks the earth in dense stands of pine trees. Further down, holly, oak and ash trees line the banks of mountain streams, and goats graze between granite rock formations. Rubén Bernal, a guide at Guadarrama National Park, knows his trees. Walking down the mountain, he points out junipers, oaks, alders, honeysuckles, blackthorns, wild privets, butcher’s brooms – and the wild apple, which he said is the most protected. “Buckthorn, madrone – everything near the water,” Bernal said. Bernal explained that the forests here were burned to make charcoal, or to clear land for sheep to graze – once common practices throughout Spain. When the government first took stock of the damage in the late 19th century, it estimated that 5 or 6 million hectares – or about 10 percent of the country’s land area – would need to be replanted. The reforestation work continues to this day. Bernal volunteers with a reforestation group called Reforesta, planting new saplings. Reforesta is trying to replace the native trees lost in two parts of the Guadarrama. “Conserving the landscape – which means restoring the forests here before – that’s our goal,” said Bernal. 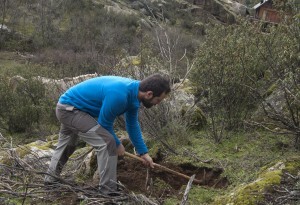 He shows volunteers how to plant native species among the invasive plants that dominate this corner of Guadarrama. Bernal said that they don’t plant in rows or geometric forms. Instead, the team tries to imitate nature. “We’re looking for the favorable micro-sites. That’s why the plants are half-hidden among the bushes,” Bernal explained. 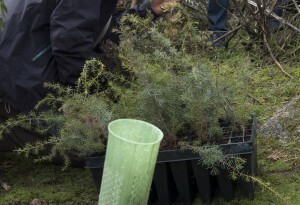 It can take a volunteer half an hour to choose the right spot, dig a hole, and plant a sapling. Then they sprinkle dead leaves and other organic material on top of the dirt around the tree to protect the soil from drying out. At the Institute for Food and Agriculture Research and Technology in Madrid, scientist Gregorio Montero said that centuries of deforestation have caused a serious erosion problem in Spain. “Spain has been a country of shepherds and farmers since the beginning of the Middle Ages,” he said. “Its natural resources have degraded – large forests became scrubland,” Montero said. As in the Sierra de Guadarrama, landowners across Spain burned or cut down their trees, then ran herds of sheep or cattle across the land. The lack of trees has exposed the topsoil, allowing nutrients to be washed out with the rain, making it less fertile. And without trees, the soil cannot retain water. This, in turn, dries out the soil, causing the surface to harden to the point where rain can no longer penetrate it. This can lead to flooding, as well as making it difficult for new trees to take root. By the mid-19th century, Spanish landowners observed their soil being washed away into the sea. Montero said that in 1867, the Spanish government created a reforestation commission. This was supposed to restore headwaters – the higher-elevation places where rivers and streams are born. But “the effects were few,” he added. Despite a lack of action on the issue, reforestation held its place in the agenda as Spain lost its last colonies and its government changed hands dozens of times. During the Spanish Civil War, which eventually led to installation of the fascist Franco administration, lawmakers passed a major reforestation law. Over the next 40 years, Spain planted upwards of 4 million hectares. Pablo Sanjuanbenito is currently in charge of carrying out Madrid’s regional forestry plan. He explained how important forests are for protecting the water sources that sustain the Spanish capital, Madrid, with its 6 to 7 million inhabitants. Spanish authorities are also increasingly interested in protecting forests for their carbon credit value – forests are one of the main carbon dioxide sinks on the planet. As Spain carries out reforestation, it tries to avoid past mistakes. In previous reforestation attempts, a single species was planted in a monoculture. And on many occasions, exotic plants were introduced, also for commercial production, Sanjuanbenito said. One of the most popular commercially planted trees is eucalyptus, a species which is imported from Australia. It grows exceptionally fast, which is appealing for private landowners. But eucalyptus requires a lot of water, which is less than ideal in an arid country. Sanjuanbenito said widespread eucalyptus increases the chance of forest fires. His agency is working to bring slower-growing native species back to Spain’s forests. “Now, all the plantings we do are protective, not productive,” Sanjuanbenito said. Back at the Guardarrama national park, Bernal and the other volunteers continue the slow work of replanting the country’s forests. Bernal described the technique as he completed planting an apple tree. “We put them in here so the goats don’t eat them,” Bernal said. “When I come here and I see an apple tree, it makes it all worth it,” Bernal concluded.